A romantic cheese cake suitable for a smaller celebration.To serve approximately 30 people. 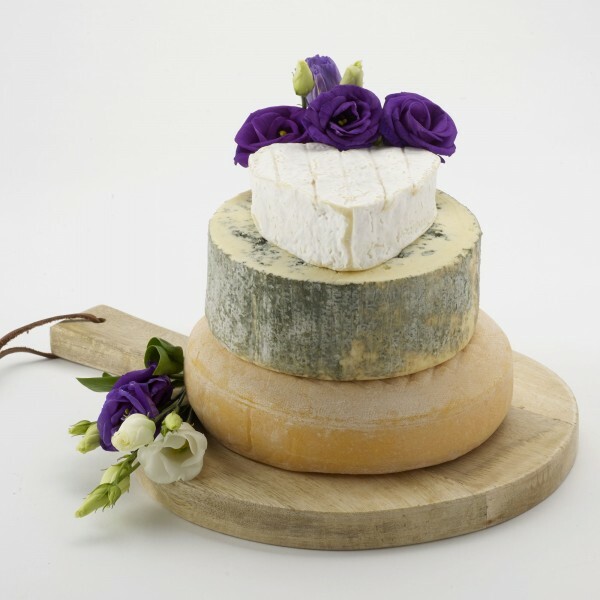 One of the smaller cakes in our Celebration Cheese Wedding Cake range, including the romantic heart shaped Coeur de Neufchatel. To serve approximately 30 people. The diameter of the base cheese (Gubbeen) is approximately 17cm. Coeur de Neufchatel PDO 200g x 2- Similar to Camembert in taste and texture but richer, coarser and heart-shaped, this is the oldest cheese of Normandie. Cashel Blue 750g - A mellow, subtle and creamy blue cheese handmade on a family farm in County Tipperary. Gubbeen 1.2kg- A tasty cheese handmade on the west coast of Ireland. A firm supple cheese with a nutty, burnt caramel taste. N.B decoration and board not included.